The gateway sign or post marking the entrance to a Shinto shrine. They are made of stones and sometimes woods with two rounded poles on either sides of the road and a crossbar. Though this one here has two orange poles and a black crossbar on top, other toriis may be all orange, red or even stone gray. 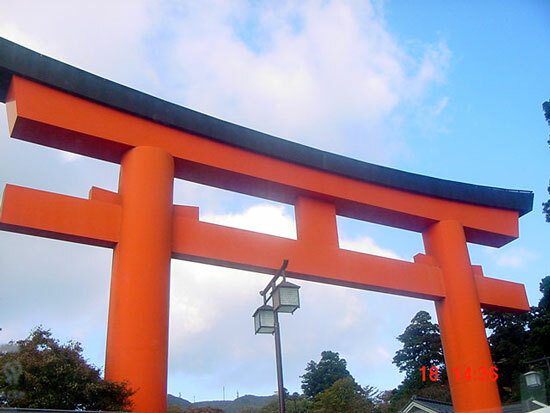 This large orange and black painted torii on the main street of Moto-Hakone and others on the Ashi lake serves as notices to tourists and worshippers that there is a shrine in the city.